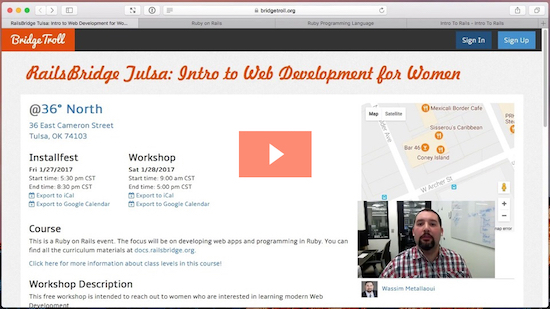 This free workshop is intended to reach out to women who are interested in learning modern Web Development. Each woman is allowed to bring a guest of any demographic who also needs to RSVP via this form. In this workshop, we'll take you through the process of building a complete web application using Ruby on Rails. By the end of the day, you'll have an application that connects to a database, reads and writes data, and renders HTML in a browser. If you've never attended a RailsBridge event or used Rails before, please come to the Friday night Installfest. We'll meet up Friday to install all of the software you need, and then spend Saturday learning and writing code. Programmers of all skill levels are welcome. The Central Library in the Pocahontas Greadington Learning & Creativity Center. You'll use the elevators to go down a floor to Lower Level 2. Once you see Starbucks ask someone for the elevator to the lower level! The parking garage is accessible off of 4th and 5th streets. Bring your parking ticket inside for free parking. Some form of sustenance will be provided Friday night at Installfest, likely pizza. Saturday morning there will be a light breakfast comprised of bagels, pastries, and coffee. Saturday afternoon lunch will be provided, with dietary restrictions accounted for.